“This is the check-engine light,” Beckwith said. The green line is scary as hell, as is the gap between green and yellow. We’re using more water than the system seems capable of providing. But if we’re going to make sense of the decline in Lake Mead, we also have to think through why the yellow line, the line showing water use in the Colorado River Basin, is bending down. The basic message, seen time and again in arid western North America, is that people tend to speed recklessly toward the water supply cliff, but when they near it, they almost inevitably hit the brakes. It would be great if we weren’t so reckless in the speeding part, but that seems to be an inevitable result of historical contingency, the problem of path dependence, and human nature. Blame our historical selves if you must, but whatever. That’s done. The key here is the “hitting the brakes” part. So what bent the yellow curve down? The second thing is just same old same old in the Upper Basin. As Mike Cohen likes to remind me, when you’re up at the headwaters part of the system without a big reservoir above you, when there’s less snow in the mountains above you, you use less water. “Shortage” is a normal part of variability. These people have the “adaptive capacity” already built in. There are two common themes that emerge here. 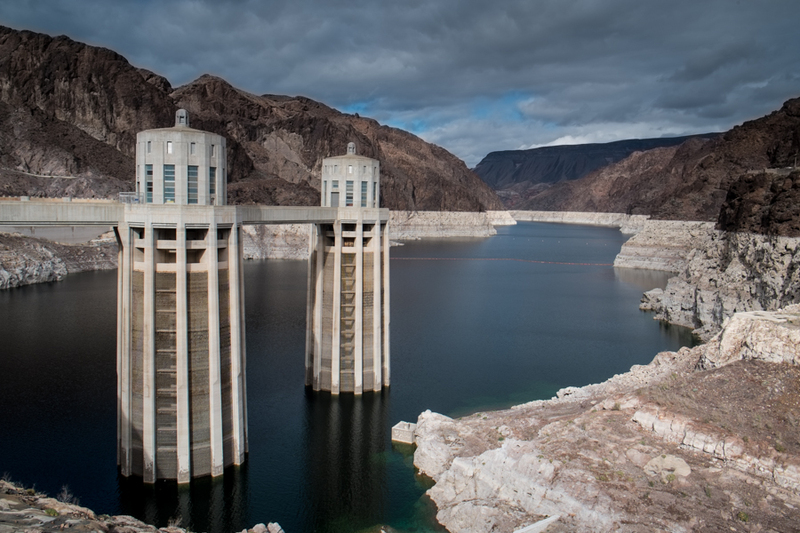 The first is a boundary condition: once the water gets scarce, people use less water. The second is the nature of the adaptive capacity, which is a bunch of fuzzy social and human and institutional stuff that you’ve got to be able to call on to either succeed or fail when the boundary condition whacks you upside the head and says, “Yo, less water this year!” It’s that adaptive capacity (the ability to pivot to conservation, or ag-urban transfers, or some such) that determines whether you succeed or fail. 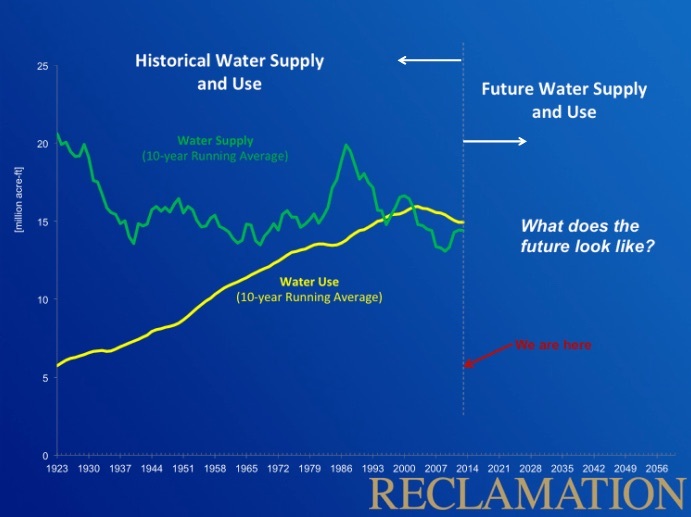 The yellow line on Terry’s graph suggest we’re already stomping on the brakes, but yellow is still above green, meaning water use still exceeds supply. What can we learn from the stuff that’s already working to help us step on the brakes a bit harder? OK, I’ll gladly buy your book at a book-signing site of your choice…but I’m not getting any younger (or smarter), so get it done! It would be instructive to add actual use in addition to the 10 year running average: a running average necessarily incurs a lag (5 years for 10 year running average), unless you do a centered average, in which case you shift the yellow curve to the left 5 years (bringing the end point to 2009. Either way, as presented it is hard to see what we had the last 10 years, or what the trend is currently.